We have a unique setting within our restored antique barn for you to enjoy a Farm Market, Winery & Outdoor Cafe. Taste wines at the bar then enjoy your favorite with a bite to eat under an umbrella on the outdoor patio. Enjoy the great selection of wine themed items & take your favorite home. Select fresh produce in season & choose from a variety of specialty foods. Our family is proud to be part of a rich farming community for 5 generations. Through the years we have seen many changes and are excited about the future. 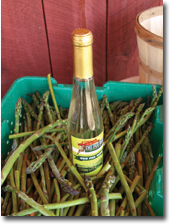 The basis of our business is the care of 2000 acres of land that is ¾ planted to fruit with a little asparagus and the remaining is wood lots that are managed by a forester. Our Farm Market was introduced in 2005 & the Winery added in 2008. This has been quite an adventure & we enjoy sharing it with you.